In one of the most enchanting positions of the Riviera with breathtaking views of the sea and the Pontine islands on two floors with private entrance and large outdoor spaces to enjoy the outdoors Villa Limoneta is a house at inside of a residential area . Ideal for those who love peace, but also the convenience of a position overlooking the sea, 5 km from the center of Sperlonga and the beach sand. Description: Apartment 4 + 2 pers. 70 sqm. about The villa consists on the second floor of a double bedroom with sea view balcony, a room with two beds and a bathroom and window. On the first floor large living room with fully equipped kitchen with oven. Double sofa bed and TV, a bathroom with separate shower. The door leads directly to the large sea view terrace with tables and chairs and sun umbrella and barbecue. The furniture is comfortable. Parking. Distance beach 5 km - 5 km away shops. The location of the villa is simply spectacular. 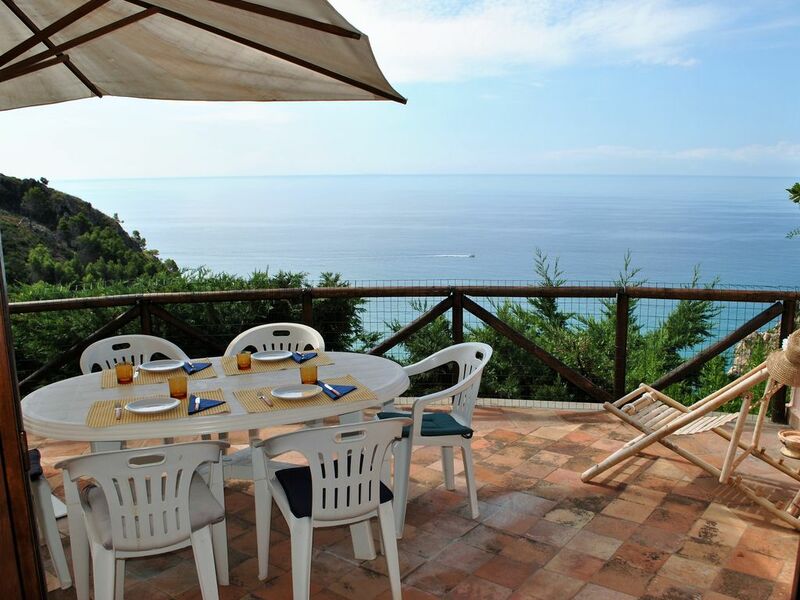 The view of the tyrrhenian sea leading into the Mediterranean is amazing. The two balconies leading to the view are wonderful. The path down to the beach isn't exactly ideal for wearing flipflops - it's down the side of the mountain, and isn't for people of whom don't want to work up a sweat. The beach at the end of the path is small as it's in a bay, and there's a restaurant / bar on the beach, which plays music every Saturday night. The music is quite loud, so closing the doors is almost compulsory. But, to close the doors, is a slight issue. The downstairs doors had to be pushed to be closed, as the doors were too big, and would scrape against the tiles. The shutters had the exact same issue downstairs. There are score marks in the tiles from the path of the doors. The shutters also would not lock as they were supposed to. The air-con was not working when we arrived, and there seemed to be no attempt to fix it. We were given two fans as a replacement, which was a kind gesture, but hardly air-con. Although the site claims there is internet, there is no wifi. Mobile phone signal is poor at best, unless you go onto the roof. The hob extractor fan did not work either, nor did one of the burners. Though this wasn't a big deal, it did become rather stuffy inside the house, and food smells lingered. A CD player was provided, but this too did not work. The second bedroom beds were uncomfortable - they would have been ideal for someone under the age of 7, but as the mattresses were very thin, anyone older or heavier hit the board underneath. The site also states that a microwave and toaster were present, but they were not. But having said this, overall, as a house, it's lovely. The details were not there, which prevented a glowing review. In the main town of Sperlonga, Itri, Fondi, Gaeta, and Formia, there were restaurants, although we did not eat at any of them. The attractions mainly include museums and beaches. The Grotte di Tiberio is amazing to visit, but small. Most of the beaches were private, so you had to pay. There was also Woodpark. This is an adventure park of climbing and being suspended in the trees in the mountain, but this is for people of whom are energetic, and happy to work in 35 degrees Celsius or more. Overall, it's a beautiful place to visit, but the details are poor. The manager, Letizia, is a lovely woman, and so is her handyman, who came out to us twice. Thanks for leaving your comment we proceeded to put the microwave and toaster, we hope to have you again welcome guests. Best regards The owner. From Sperlonga, after a 10 minutes mountaindrive with nice views, you reach a small gated community in which the villa is located. The manager (Letizia) was very helpfull on arrival and later on, taking care of minor inconveniences. The house was clean and well equipped. The photos and discription give a good impression of what to expect. All in all a relaxing holiday experience.